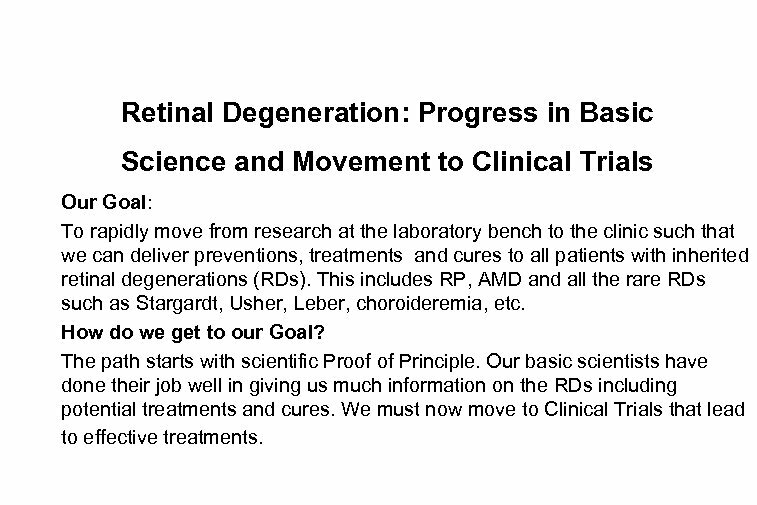 Retinal Degeneration: Progress in Basic Science and Movement to Clinical Trials Our Goal: To rapidly move from research at the laboratory bench to the clinic such that we can deliver preventions, treatments and cures to all patients with inherited retinal degenerations (RDs). This includes RP, AMD and all the rare RDs such as Stargardt, Usher, Leber, choroideremia, etc. How do we get to our Goal? The path starts with scientific Proof of Principle. Our basic scientists have done their job well in giving us much information on the RDs including potential treatments and cures. We must now move to Clinical Trials that lead to effective treatments. 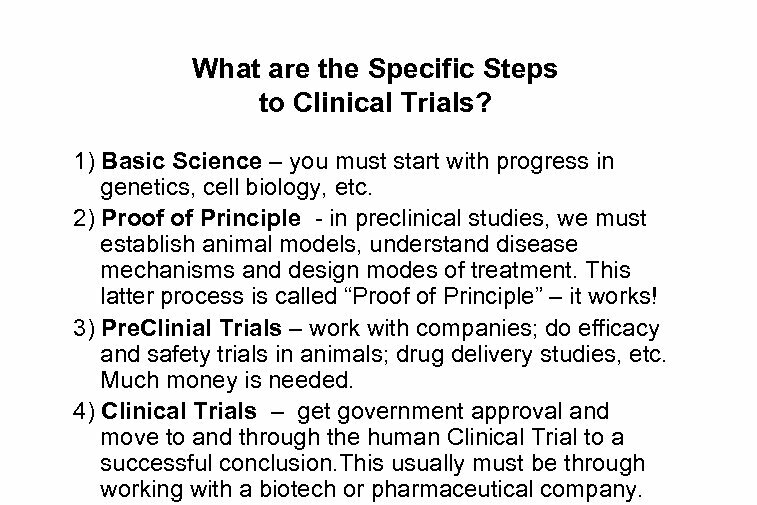 What are the Specific Steps to Clinical Trials? 1) Basic Science – you must start with progress in genetics, cell biology, etc. 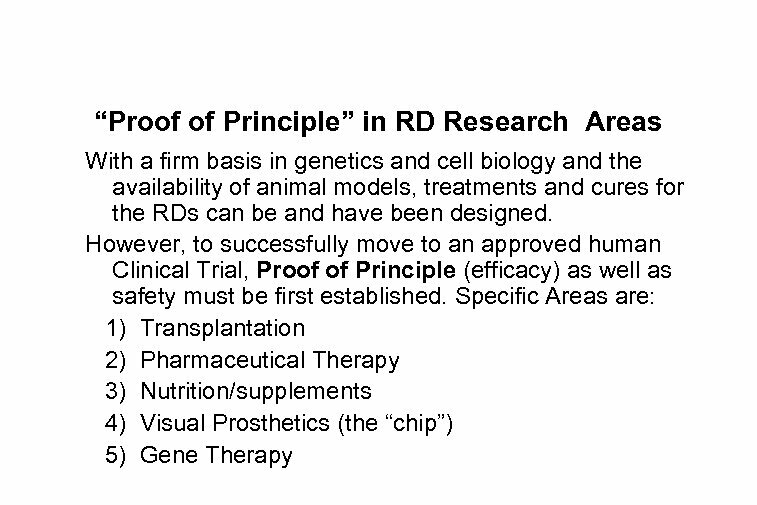 2) Proof of Principle - in preclinical studies, we must establish animal models, understand disease mechanisms and design modes of treatment. This latter process is called “Proof of Principle” – it works! 3) Pre. 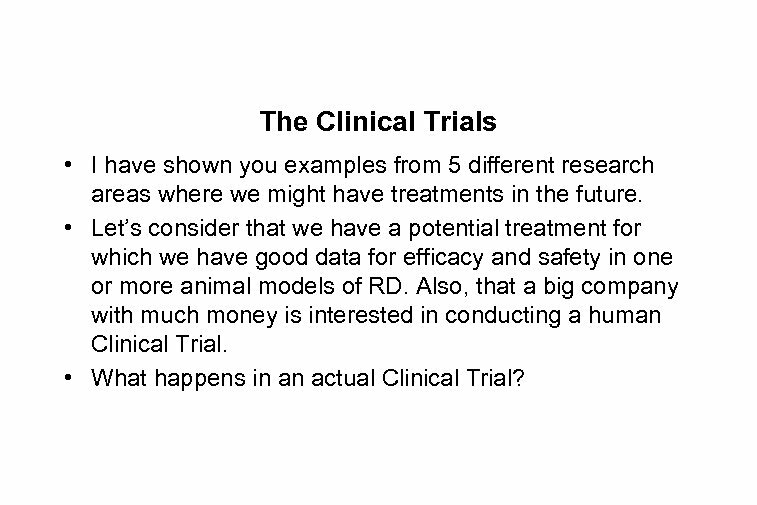 Clinial Trials – work with companies; do efficacy and safety trials in animals; drug delivery studies, etc. Much money is needed. 4) Clinical Trials – get government approval and move to and through the human Clinical Trial to a successful conclusion. This usually must be through working with a biotech or pharmaceutical company. 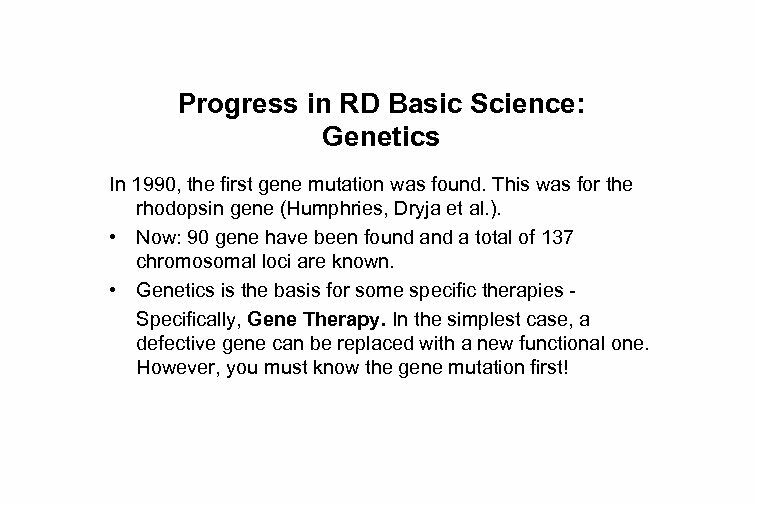 Progress in RD Basic Science: Genetics In 1990, the first gene mutation was found. This was for the rhodopsin gene (Humphries, Dryja et al. ). • Now: 90 gene have been found a total of 137 chromosomal loci are known. • Genetics is the basis for some specific therapies Specifically, Gene Therapy. In the simplest case, a defective gene can be replaced with a new functional one. However, you must know the gene mutation first! Genetics: The Needs and the Challenge The Needs: • Genotyping - Molecular Diagnosis for all RD patients. • We need national and international Patient Registries. 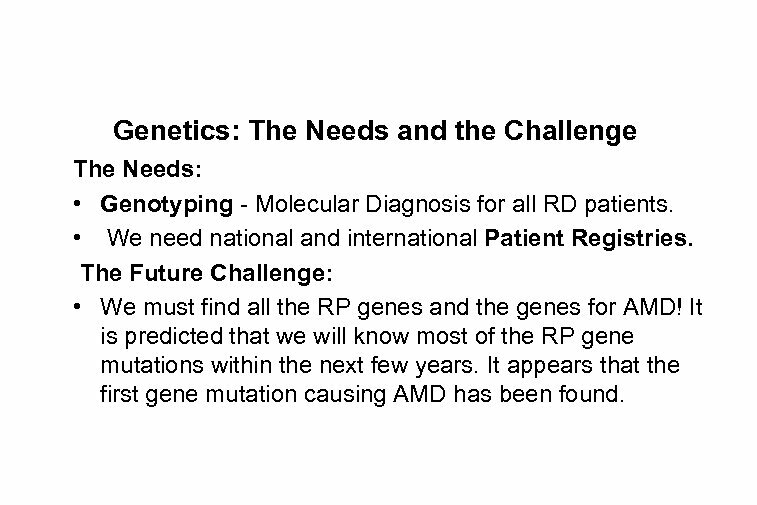 The Future Challenge: • We must find all the RP genes and the genes for AMD! It is predicted that we will know most of the RP gene mutations within the next few years. It appears that the first gene mutation causing AMD has been found. 1. 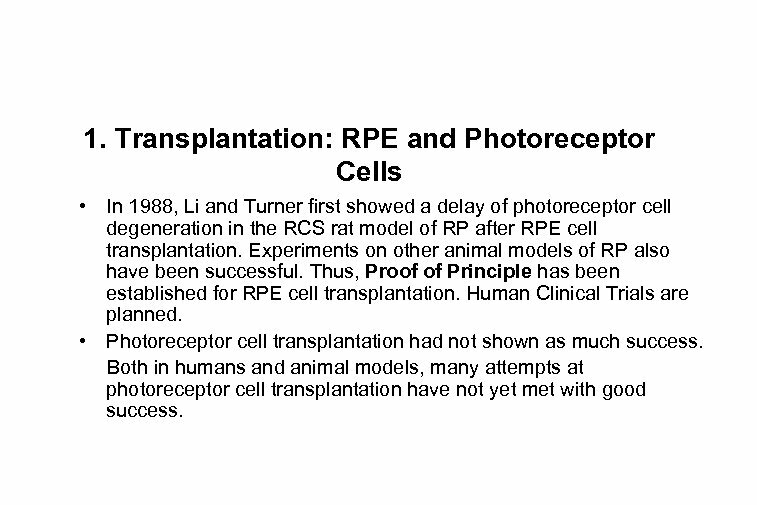 Transplantation: RPE and Photoreceptor Cells • In 1988, Li and Turner first showed a delay of photoreceptor cell degeneration in the RCS rat model of RP after RPE cell transplantation. Experiments on other animal models of RP also have been successful. Thus, Proof of Principle has been established for RPE cell transplantation. Human Clinical Trials are planned. • Photoreceptor cell transplantation had not shown as much success. Both in humans and animal models, many attempts at photoreceptor cell transplantation have not yet met with good success. Transplantation: Stem Cells An exciting new area of transplantation study is that of Stem Cell research. Stem cells are primitive, undifferentiated cells that have the ability to differentiate into many types of mature, adult cell types – liver, skin, photoreceptor cells. Where are stem cells found? Stem cells are, of course, present in embryonic tissue. However, small numbers have recently been found in many adult tissues. For example, Van der Kooy et al. was the first to find stem cells at the edge of the retina in the eye of the adult mouse. 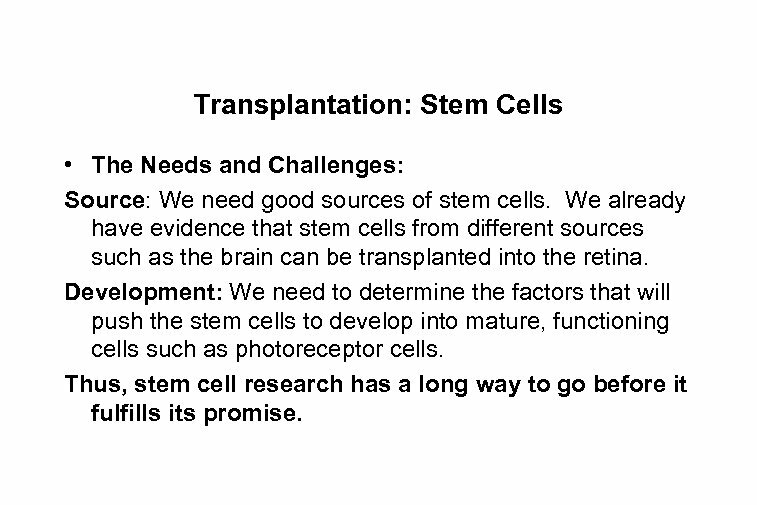 Transplantation: Stem Cells • The Needs and Challenges: Source: We need good sources of stem cells. 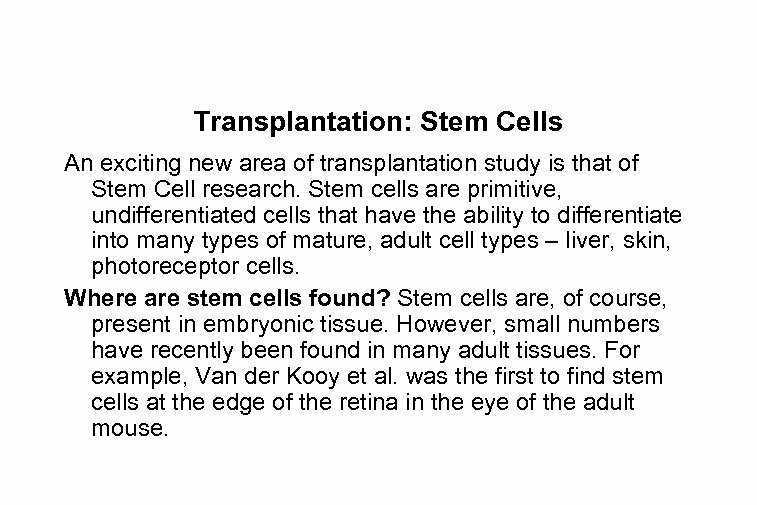 We already have evidence that stem cells from different sources such as the brain can be transplanted into the retina. Development: We need to determine the factors that will push the stem cells to develop into mature, functioning cells such as photoreceptor cells. Thus, stem cell research has a long way to go before it fulfills its promise. Transplantation: The Needs and the Challenge The Needs: • We need to move to human Clinical Trials for RPE cell transplantation. • Much basic work yet needs to be done on photoreceptor transplantation! 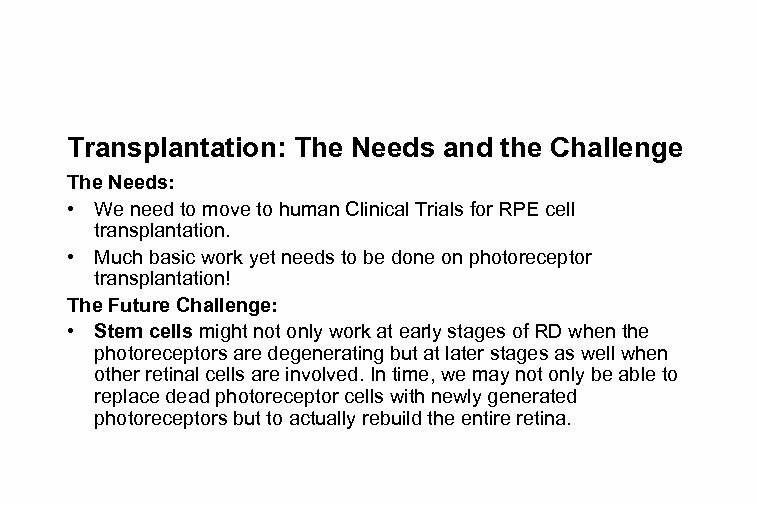 The Future Challenge: • Stem cells might not only work at early stages of RD when the photoreceptors are degenerating but at later stages as well when other retinal cells are involved. In time, we may not only be able to replace dead photoreceptor cells with newly generated photoreceptors but to actually rebuild the entire retina. 2. Pharmaceutical Therapy • Pharmaceutical Therapy can be defined as the use of any agent (a natural neuron-survival agent , a synthetic drug, etc. ) to prolong the life and function of a photoreceptor cell. 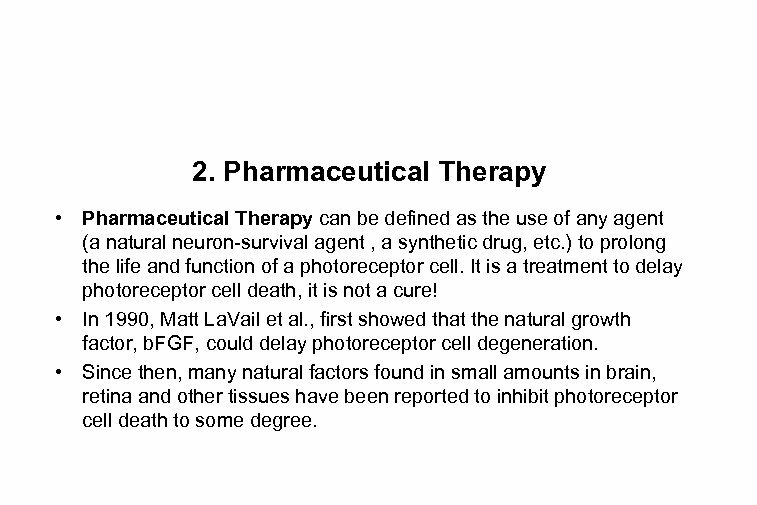 It is a treatment to delay photoreceptor cell death, it is not a cure! • In 1990, Matt La. Vail et al. , first showed that the natural growth factor, b. FGF, could delay photoreceptor cell degeneration. • Since then, many natural factors found in small amounts in brain, retina and other tissues have been reported to inhibit photoreceptor cell death to some degree. 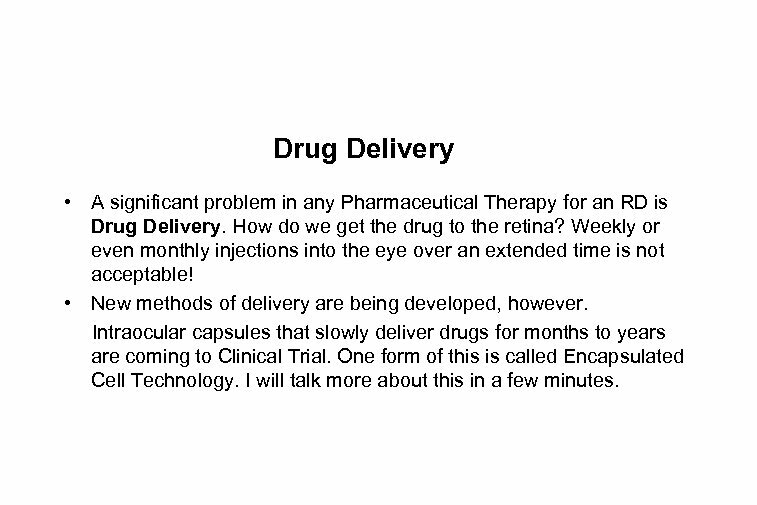 Drug Delivery • A significant problem in any Pharmaceutical Therapy for an RD is Drug Delivery. How do we get the drug to the retina? Weekly or even monthly injections into the eye over an extended time is not acceptable! • New methods of delivery are being developed, however. Intraocular capsules that slowly deliver drugs for months to years are coming to Clinical Trial. One form of this is called Encapsulated Cell Technology. I will talk more about this in a few minutes. 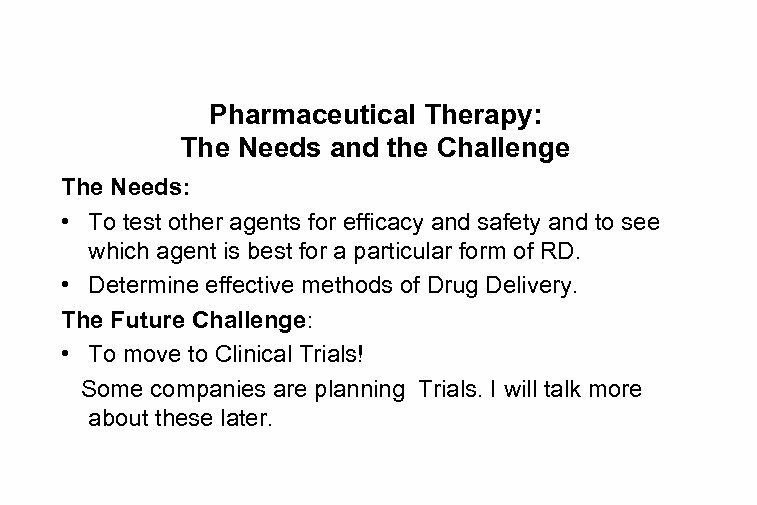 Pharmaceutical Therapy: The Needs and the Challenge The Needs: • To test other agents for efficacy and safety and to see which agent is best for a particular form of RD. • Determine effective methods of Drug Delivery. The Future Challenge: • To move to Clinical Trials! Some companies are planning Trials. I will talk more about these later. 3. Nutrition: A Life of its Own? • The use of nutritional supplements as a therapy in RD has been controversial but now must be taken seriously in prevention or at least slowing down the RDs, especially AMD. • In 1983, Converse et al. 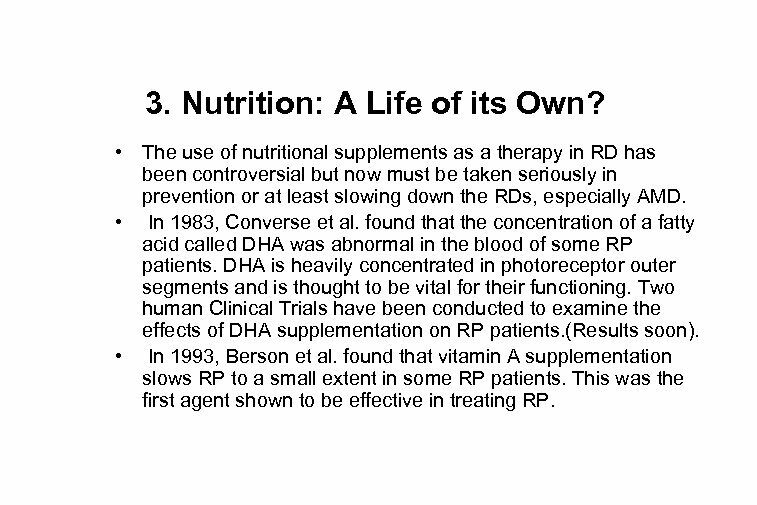 found that the concentration of a fatty acid called DHA was abnormal in the blood of some RP patients. DHA is heavily concentrated in photoreceptor outer segments and is thought to be vital for their functioning. Two human Clinical Trials have been conducted to examine the effects of DHA supplementation on RP patients. (Results soon). • In 1993, Berson et al. found that vitamin A supplementation slows RP to a small extent in some RP patients. This was the first agent shown to be effective in treating RP. Nutrition • The AREDS Clinical Trial of the NEI has ended after many years of study. It found that some nutritional supplements helped in delaying the progression of AMD. The nutrients studied were zinc, B-carotene and vitamins C and E. • Lutein is a nutrient that is highly concentrated in the macula. It is thought to be an antioxidant and thus may protect photoreceptor cells in the macular region. It is currently being tested as to its effects in both AMD and RP. 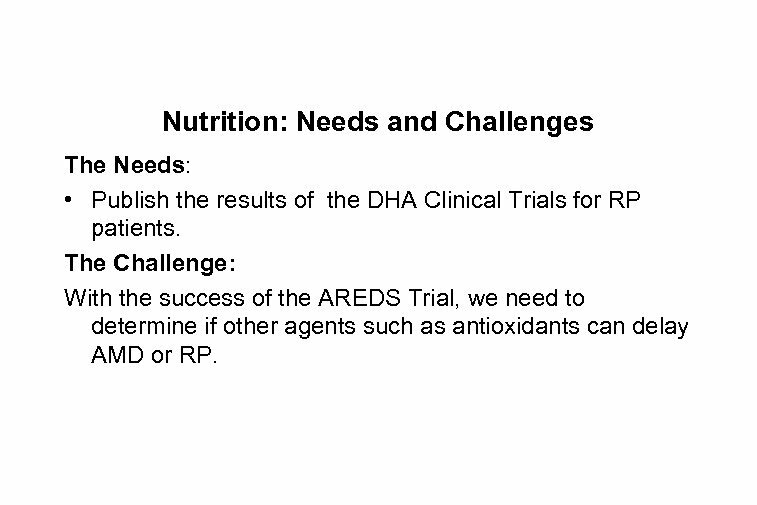 Nutrition: Needs and Challenges The Needs: • Publish the results of the DHA Clinical Trials for RP patients. The Challenge: With the success of the AREDS Trial, we need to determine if other agents such as antioxidants can delay AMD or RP. 4. 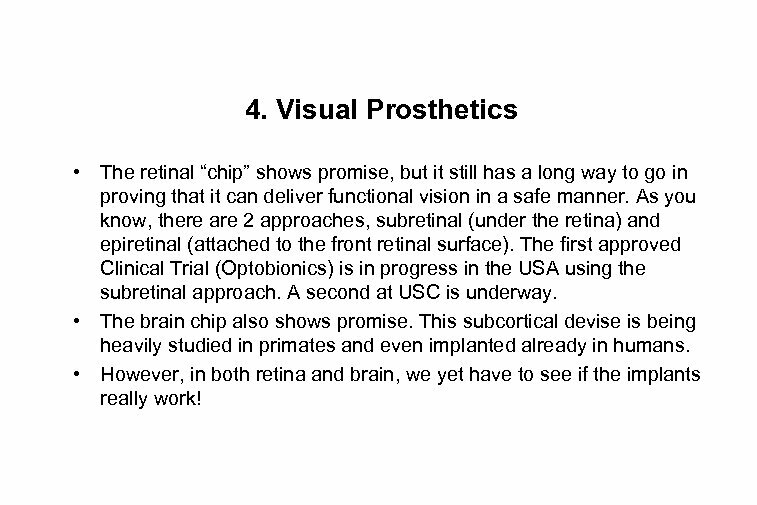 Visual Prosthetics • The retinal “chip” shows promise, but it still has a long way to go in proving that it can deliver functional vision in a safe manner. As you know, there are 2 approaches, subretinal (under the retina) and epiretinal (attached to the front retinal surface). The first approved Clinical Trial (Optobionics) is in progress in the USA using the subretinal approach. A second at USC is underway. • The brain chip also shows promise. This subcortical devise is being heavily studied in primates and even implanted already in humans. • However, in both retina and brain, we yet have to see if the implants really work! Visual Prosthetics: Needs and Challenges The Needs: • In the current Optobionics Clinical Trial, there is a need to prove real efficacy. • We must also prove safety for both the human subject and the electronic implant. The ocular environment can be very rough on an implant! 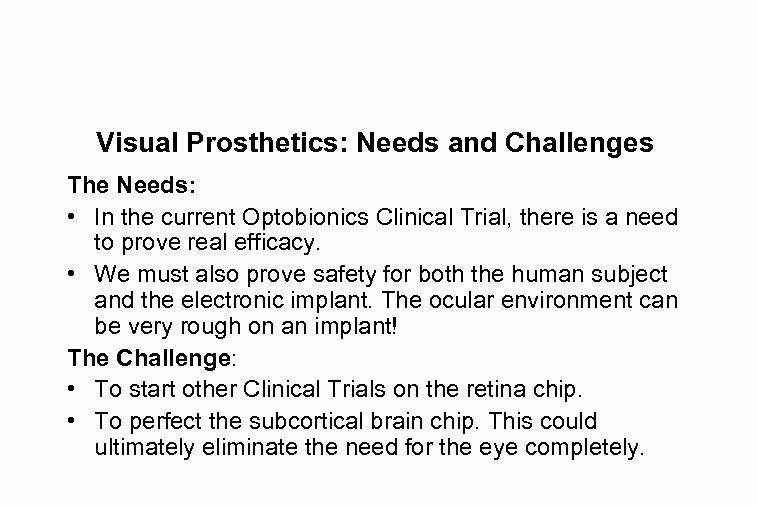 The Challenge: • To start other Clinical Trials on the retina chip. • To perfect the subcortical brain chip. This could ultimately eliminate the need for the eye completely. 5. Gene Therapy There are different types of Gene Therapy that can be used for the different genetic forms of RP. • Gene Replacement: In 1996, Bennett et al. first established Proof of Principle in the recessive rd mouse model. Ali and coworkers have also markedly moved this field ahead. • Ribozyme Therapy: In 1998, Lewin, Hauswirth et al. rescued photoreceptors in a transgenic rat with a dominant type of disease using ribozyme therapy. 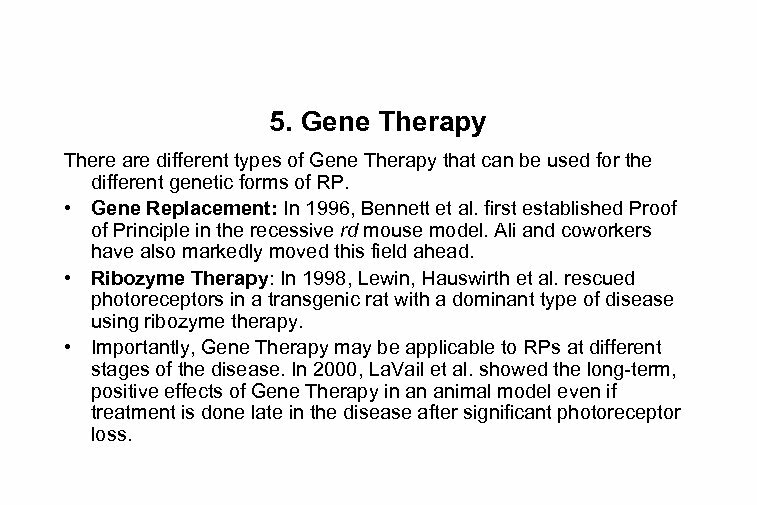 • Importantly, Gene Therapy may be applicable to RPs at different stages of the disease. In 2000, La. Vail et al. showed the long-term, positive effects of Gene Therapy in an animal model even if treatment is done late in the disease after significant photoreceptor loss. Gene Therapy: the First “Cure” for a Form of RD? The newer and exciting news is that Gene Therapy can not just slow down the RD disease process but actually restore visual function. 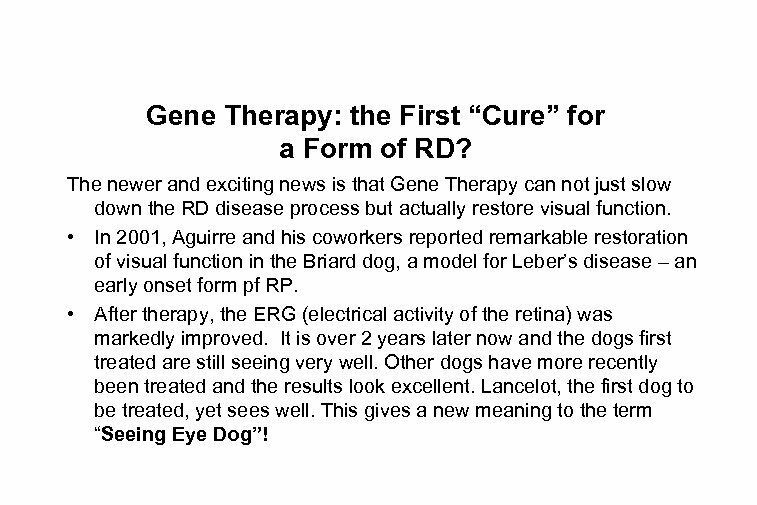 • In 2001, Aguirre and his coworkers reported remarkable restoration of visual function in the Briard dog, a model for Leber’s disease – an early onset form pf RP. • After therapy, the ERG (electrical activity of the retina) was markedly improved. It is over 2 years later now and the dogs first treated are still seeing very well. Other dogs have more recently been treated and the results look excellent. Lancelot, the first dog to be treated, yet sees well. This gives a new meaning to the term “Seeing Eye Dog”! 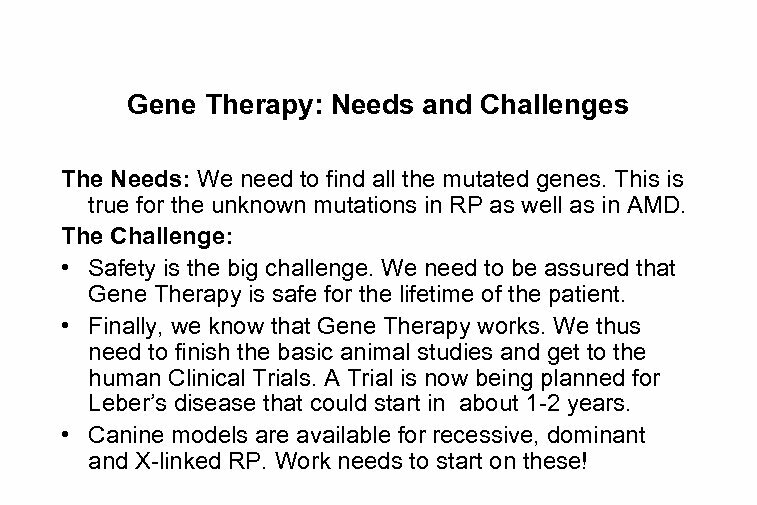 Gene Therapy: Needs and Challenges The Needs: We need to find all the mutated genes. This is true for the unknown mutations in RP as well as in AMD. The Challenge: • Safety is the big challenge. We need to be assured that Gene Therapy is safe for the lifetime of the patient. • Finally, we know that Gene Therapy works. We thus need to finish the basic animal studies and get to the human Clinical Trials. A Trial is now being planned for Leber’s disease that could start in about 1 -2 years. • Canine models are available for recessive, dominant and X-linked RP. Work needs to start on these! The Clinical Trials • I have shown you examples from 5 different research areas where we might have treatments in the future. • Let’s consider that we have a potential treatment for which we have good data for efficacy and safety in one or more animal models of RD. Also, that a big company with much money is interested in conducting a human Clinical Trial. • What happens in an actual Clinical Trial? 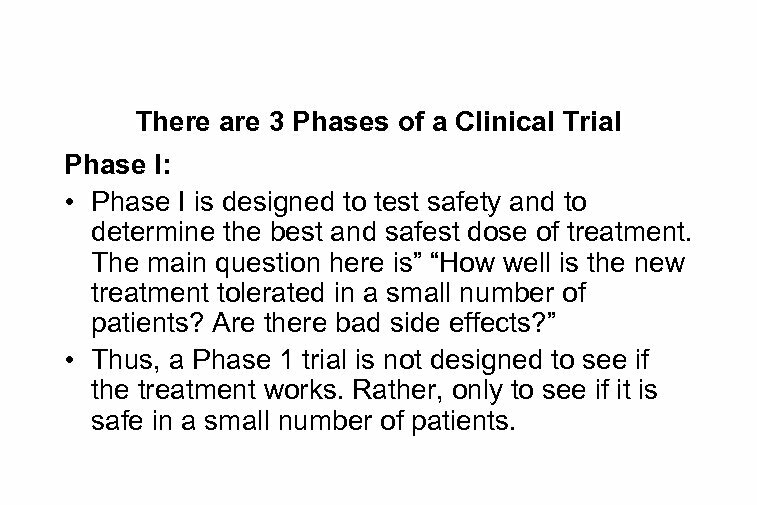 There are 3 Phases of a Clinical Trial Phase I: • Phase I is designed to test safety and to determine the best and safest dose of treatment. The main question here is” “How well is the new treatment tolerated in a small number of patients? Are there bad side effects? ” • Thus, a Phase 1 trial is not designed to see if the treatment works. Rather, only to see if it is safe in a small number of patients. Phase II is designed to determine whether the treatment has any positive effect in the human. 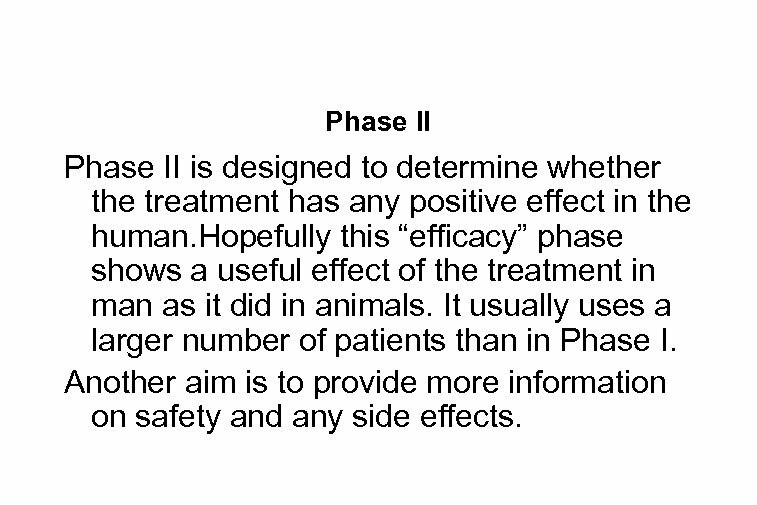 Hopefully this “efficacy” phase shows a useful effect of the treatment in man as it did in animals. It usually uses a larger number of patients than in Phase I. Another aim is to provide more information on safety and any side effects. 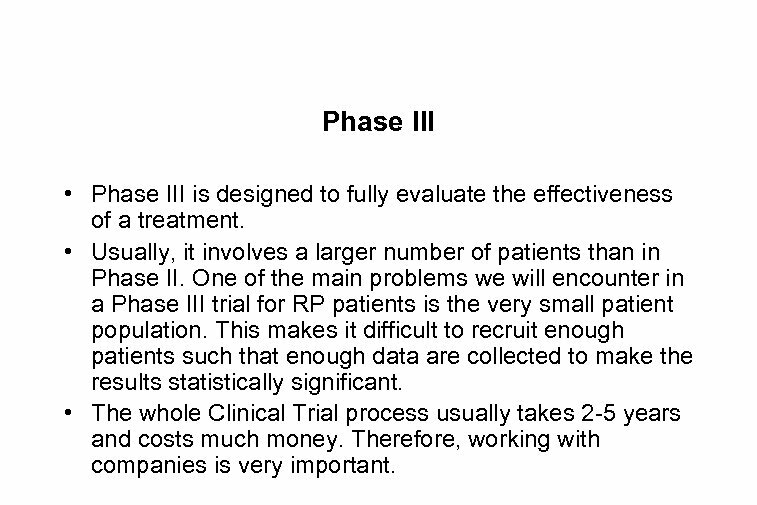 Phase III • Phase III is designed to fully evaluate the effectiveness of a treatment. • Usually, it involves a larger number of patients than in Phase II. One of the main problems we will encounter in a Phase III trial for RP patients is the very small patient population. This makes it difficult to recruit enough patients such that enough data are collected to make the results statistically significant. • The whole Clinical Trial process usually takes 2 -5 years and costs much money. Therefore, working with companies is very important. What Clinical Trials do or will we have? Most current or planned Trials are for AMD: • Visudyne – With the success of Photodynamic Therapy for wet AMD, the Novartis company is now conducting a Phase IIIB study for aggressive “Early Retreatment” of the predominantly classical form of wet AMD. 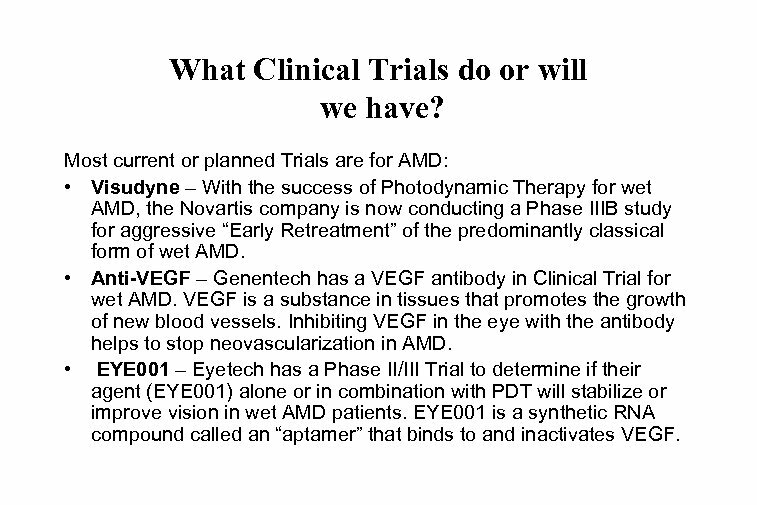 • Anti-VEGF – Genentech has a VEGF antibody in Clinical Trial for wet AMD. VEGF is a substance in tissues that promotes the growth of new blood vessels. Inhibiting VEGF in the eye with the antibody helps to stop neovascularization in AMD. • EYE 001 – Eyetech has a Phase II/III Trial to determine if their agent (EYE 001) alone or in combination with PDT will stabilize or improve vision in wet AMD patients. EYE 001 is a synthetic RNA compound called an “aptamer” that binds to and inactivates VEGF. AMD Clinical Trials • PTAMD - (Prophylactic Treatment of AMD) is a Trial at the Univ. 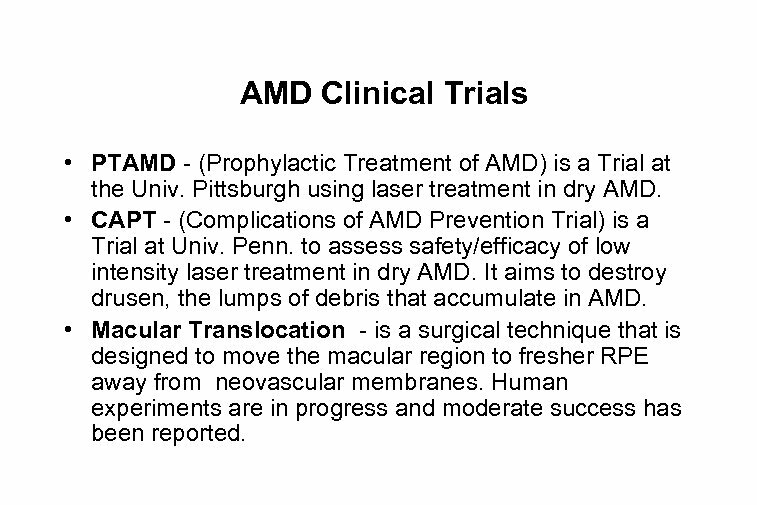 Pittsburgh using laser treatment in dry AMD. • CAPT - (Complications of AMD Prevention Trial) is a Trial at Univ. Penn. to assess safety/efficacy of low intensity laser treatment in dry AMD. It aims to destroy drusen, the lumps of debris that accumulate in AMD. • Macular Translocation - is a surgical technique that is designed to move the macular region to fresher RPE away from neovascular membranes. Human experiments are in progress and moderate success has been reported. Nutrition • Antioxidants - The AREDS Clinical Trial found that patients with advanced dry AMD who took the supplement had a reduced risk of progressing to more advanced stages of AMD. This is a help but certainly not a cure! Are there better antioxidants? • DHA –will the 2 Clinical Trials on DHA supplementation show positive results? An Usher trial is being talked about. 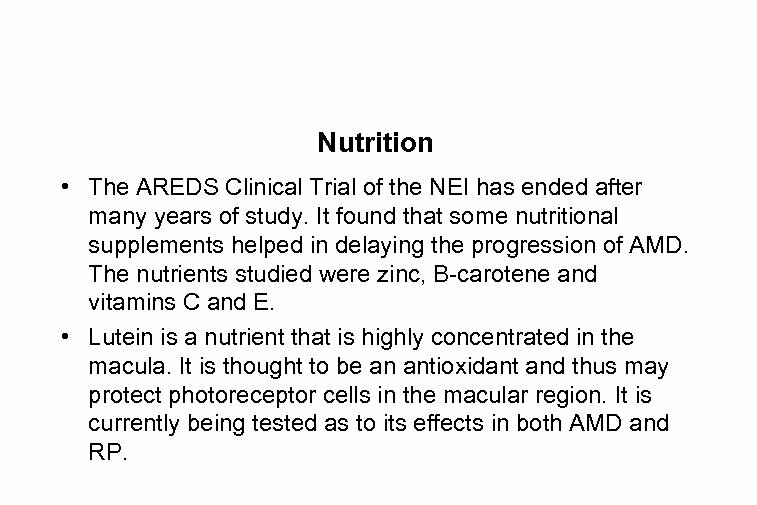 • Lutein - A small Clinical Trial with lutein is underway in AMD patients at the NEI. 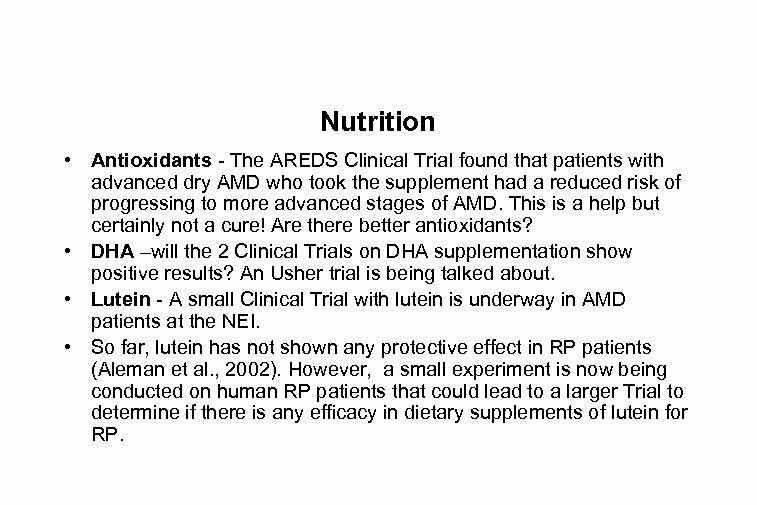 • So far, lutein has not shown any protective effect in RP patients (Aleman et al. , 2002). However, a small experiment is now being conducted on human RP patients that could lead to a larger Trial to determine if there is any efficacy in dietary supplements of lutein for RP. 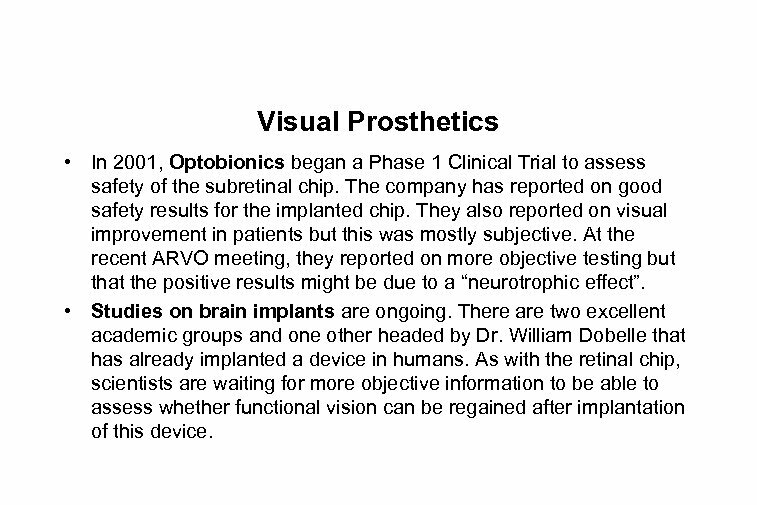 Visual Prosthetics • In 2001, Optobionics began a Phase 1 Clinical Trial to assess safety of the subretinal chip. The company has reported on good safety results for the implanted chip. They also reported on visual improvement in patients but this was mostly subjective. At the recent ARVO meeting, they reported on more objective testing but that the positive results might be due to a “neurotrophic effect”. • Studies on brain implants are ongoing. There are two excellent academic groups and one other headed by Dr. William Dobelle that has already implanted a device in humans. As with the retinal chip, scientists are waiting for more objective information to be able to assess whether functional vision can be regained after implantation of this device. 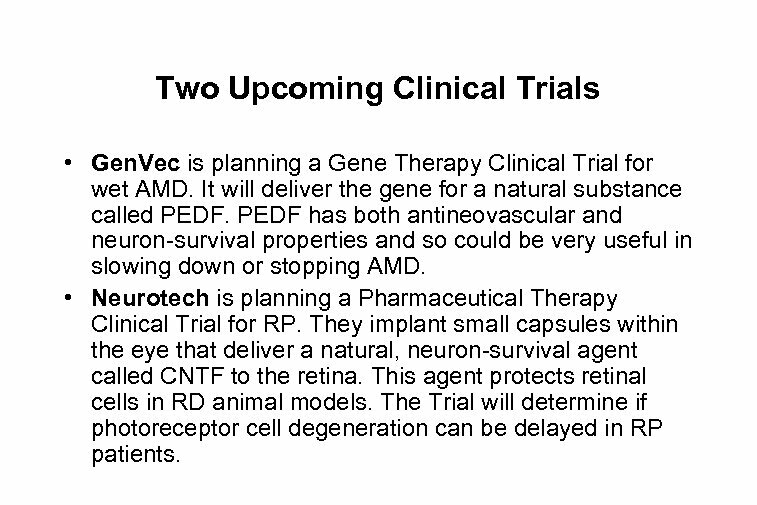 Two Upcoming Clinical Trials • Gen. Vec is planning a Gene Therapy Clinical Trial for wet AMD. It will deliver the gene for a natural substance called PEDF has both antineovascular and neuron-survival properties and so could be very useful in slowing down or stopping AMD. • Neurotech is planning a Pharmaceutical Therapy Clinical Trial for RP. They implant small capsules within the eye that deliver a natural, neuron-survival agent called CNTF to the retina. This agent protects retinal cells in RD animal models. The Trial will determine if photoreceptor cell degeneration can be delayed in RP patients. 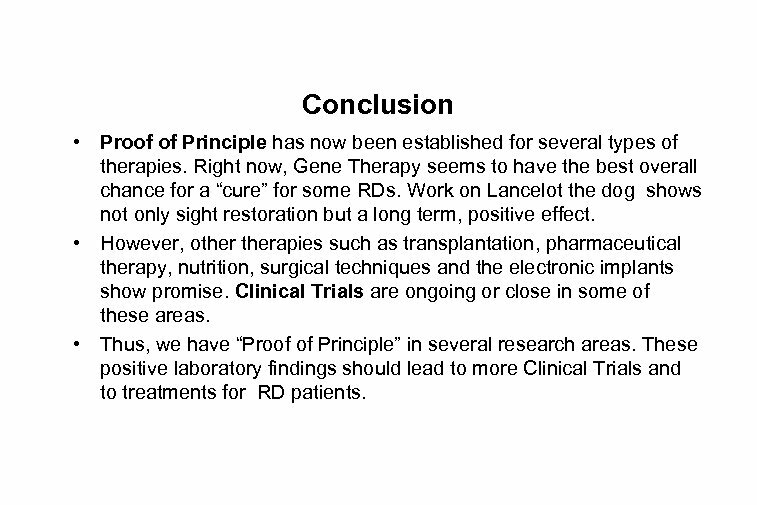 Conclusion • Proof of Principle has now been established for several types of therapies. Right now, Gene Therapy seems to have the best overall chance for a “cure” for some RDs. Work on Lancelot the dog shows not only sight restoration but a long term, positive effect. • However, otherapies such as transplantation, pharmaceutical therapy, nutrition, surgical techniques and the electronic implants show promise. Clinical Trials are ongoing or close in some of these areas. • Thus, we have “Proof of Principle” in several research areas. These positive laboratory findings should lead to more Clinical Trials and to treatments for RD patients. 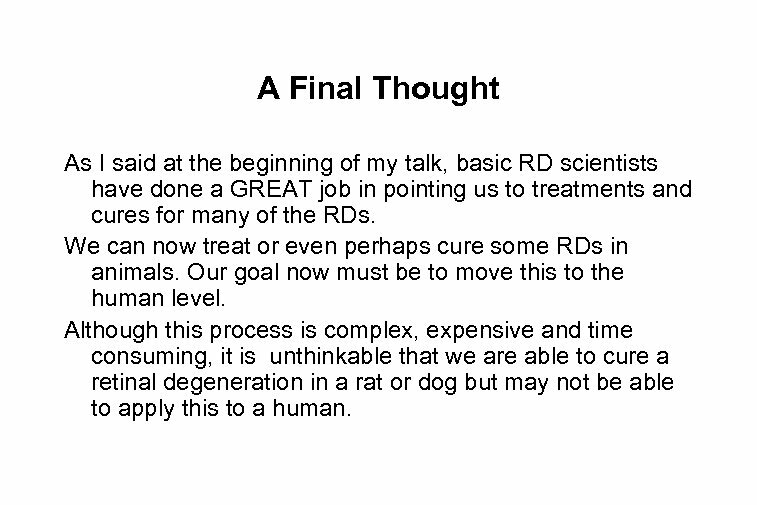 A Final Thought As I said at the beginning of my talk, basic RD scientists have done a GREAT job in pointing us to treatments and cures for many of the RDs. We can now treat or even perhaps cure some RDs in animals. Our goal now must be to move this to the human level. Although this process is complex, expensive and time consuming, it is unthinkable that we are able to cure a retinal degeneration in a rat or dog but may not be able to apply this to a human.